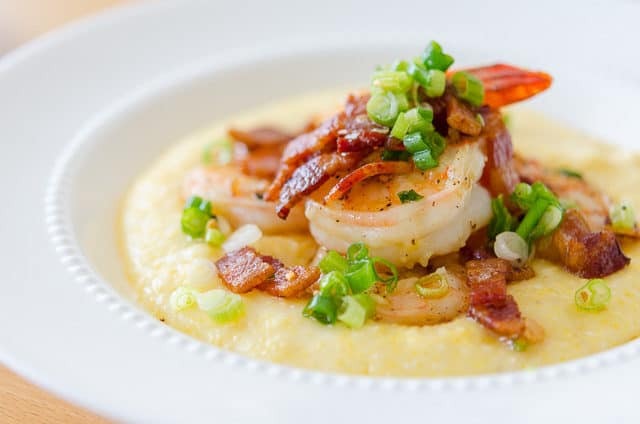 Shrimp and Grits is a quick and flavorful dish to make for a weeknight meal! The grits cook hands-off while you prepare and cook the shrimp. Shrimp and grits. Fried green tomatoes. Biscuits. Southern fried chicken. Pralines. As I pack up my dishes, pots and pans, in preparation to move North, I can’t help but think about all the quintessential Southern dishes that I’ve come to love during my time here. 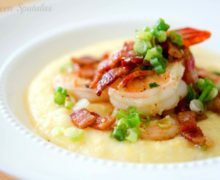 And my favorite dish hands down is shrimp and grits. I think the reason shrimp and grits is so popular down here is because it’s the perfect way to show off all the local, wild shrimp. Sure, you can drive to the grocery store and find local shrimp for sale at their seafood counter, but on your drive there you’ll see people selling them on the side of the road, freshly caught from their boats. This classic Southern dish has got some simple flavors to it, but those simple flavors enhance the shrimp while still letting it shine. For my rendition, I use scallions, bacon, garlic, lemon, and just a little hint of Tabasco. The one thing I’ll say though is to make sure you’re using wild shrimp for this dish. 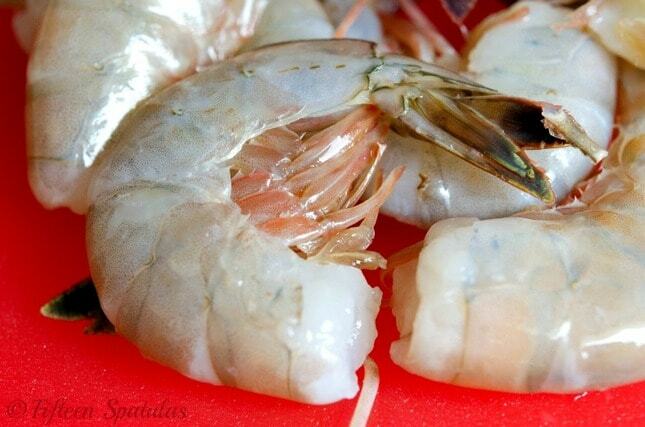 The problem with farmed shrimp is that they don’t have much flavor. This is a dish where you want to get the big, wild ones that taste of the sea. To make the grits, I use a rice cooker. I put the grits and water in the rice cooker with a pinch of salt, and push the button. If you don’t have a rice cooker, bring the water to a boil in a saucepan and add the grits. Turn the heat down to medium, stir the grits around and add a pinch of salt, then let them cook, stirring occassionally, for about 20 minutes until the water is absorbed. Once the grits are cooked, season to taste with more salt and pepper, and stir in the cheese, butter, and heavy cream. Keep the grits warm in the rice cooker or the pan. Place the bacon in a cold skillet, and turn the heat to medium. Render out the fat and cook the bacon until crisp, then use a slotted spoon to scoop out the bacon bits (but leave the grease there). 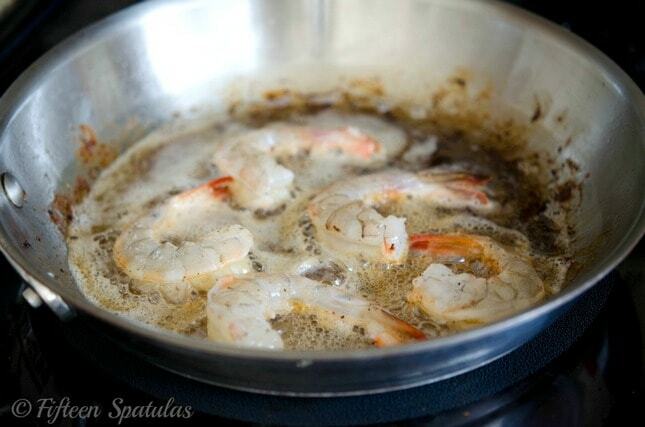 Toss the shrimp with salt and pepper, then add them in a single layer to the pan. 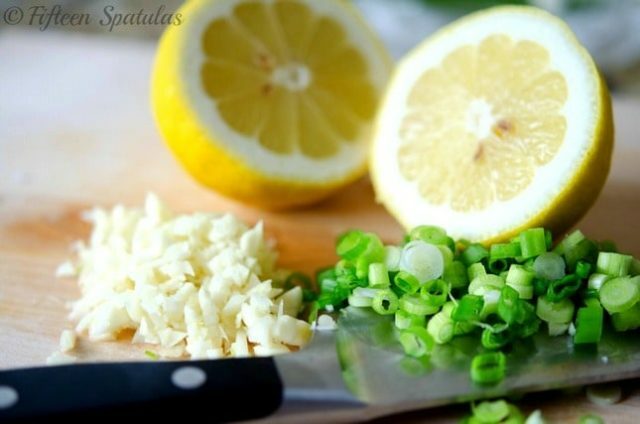 Cook on one side for about 60-90 seconds, then flip the shrimp over and add the scallions, garlic, lemon juice, tabasco, and the reserved crisped bacon. Let the shrimp cook for another minute or two until cooked through (once they turn pink, they are done. Take care not to overcook). 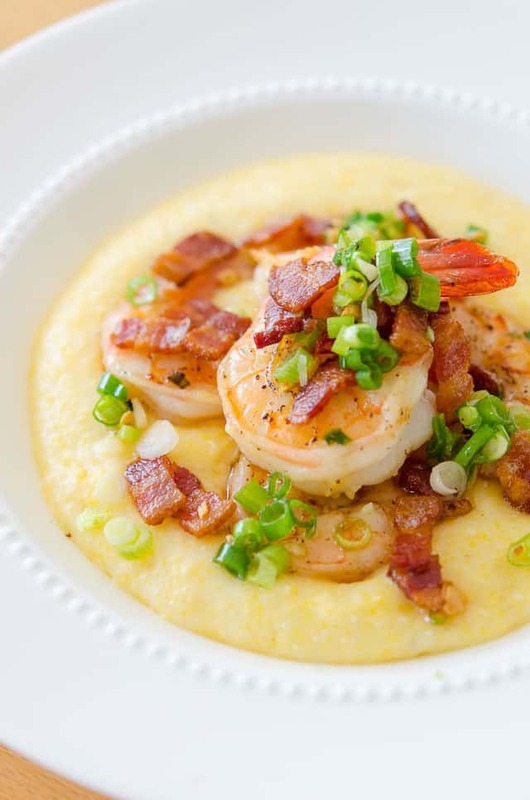 To serve, place the grits on the bottom of a bowl and scoop the shrimp on top. They taste best eaten together. Enjoy! Oh how I love shrimp & grits! One of my favorite dishes. I’d have to say the best I’ve had were at a little restaurant in Mount Pleasant, SC. So good and creamy. But yours look SO good so I’ll have to give them a try! Hi Debra, in the recipe box, do you see the little printer icon in the upper right corner? If you click that it will automatically open a print page. Let me know if you have trouble!